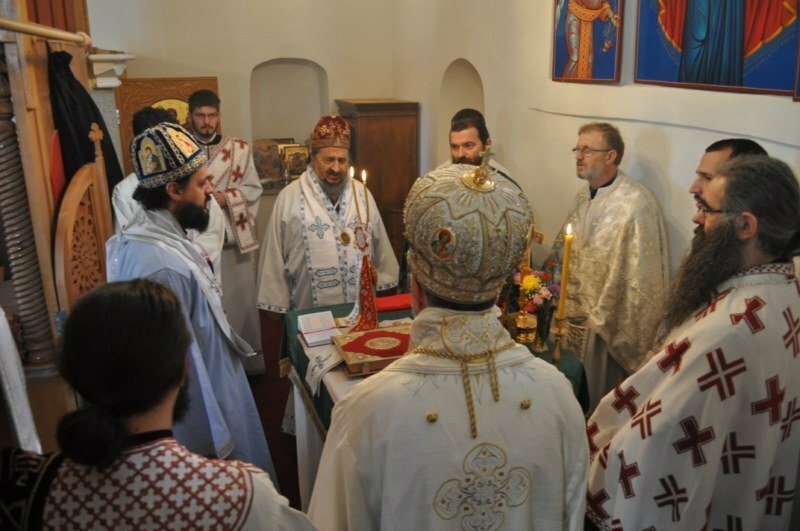 On the day of Saint Sava the Sanctified, the Holy Hierarchal Liturgy in Mostar was served by Their Graces Bishops Maxim of Western America, Grigorije of Zahumlje-Herzegovina and retired Atanasije of Zahumlje-Herzegovina with the concelebration of the abbot of Tvrdos monastery, spiritual father, Fr. Vitalije, of the Gradac Monastery, Protopresbyter-stavrophor Radivoje Krulj, Presbyter Branimir Borovcanin, Presbyter Zoran Ilic and Presbyter Mihailo Andric, Deacon Pavle Ratkovic, Hierodeacon Porfirije and Deacon Marko Gojacic. The Mostar church was too small to receive all the faithful from Mostar and the surrounding areas who came to take part in the liturgical gathering. On the same day the Church celebrated Children's Day (Detinjci) and the traditional tying of the children was organized in front of the church. In the festal joy the children were given sweets. The hierarchs visited the construction site of the new cathedral church and they went through the old part of the city of Mostar.